In large bowl, mix cookie mix, oil, water and egg with spoon until soft dough forms. Stir in 1/2 cup of the Reese’s™ Pieces™ peanut butter candy and the peanut butter chips. Press dough in bottom of pan. 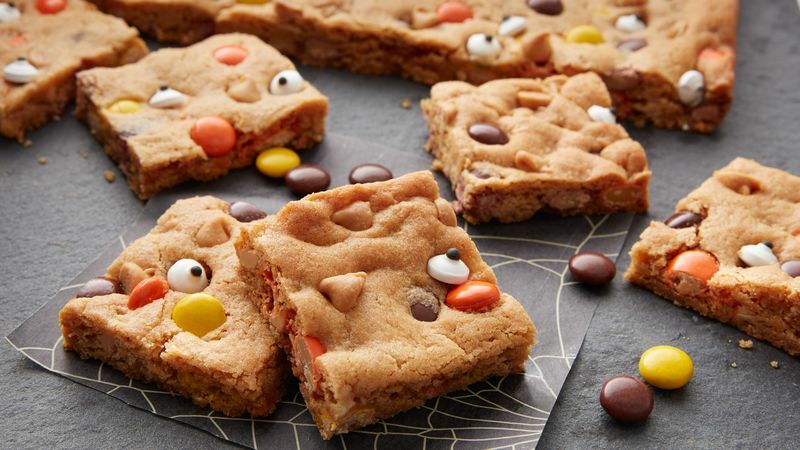 Sprinkle with remaining 1/4 cup Reese’s™ Pieces™ peanut butter candy. Bake 16 to 20 minutes or until light golden brown. Immediately place candy eyeballs randomly over top; press slightly into dough. Cool completely on cooling rack, about 1 hour. Cut into 6 rows by 4 rows. Store in airtight container.